Earth Day is approaching on April 22nd. This is a full day of experiential learning that tends to take place for many hours outdoors. A schedule will be shared next week, but plan on covering your child with sunscreen and make sure he/she is wearing clothes that may get dirty! There is no letter day assigned to this day, but it is a regular school day in terms of starting and ending times. As stated in last week's message, please plan to come to K-8 May Day on May 1st. It will run about 8:30 – 10:30am and all students are dismissed after the program concludes. All grade levels tend to have specific dress needs – make sure you check your teacher's Shutterfly. Click here for more information on the event. If your child is remaining on campus for Extended Day, please let your teacher know. Come join us on Thursday, April 25th for the rescheduled LS Coffee for us to discuss our sexual education curriculum. Parent feedback appreciated! We will meet from 8:00 – 9:00 in the Dahl! Starting today, we will finalize the last stage of the C Playground update. The current slide structure will be removed and a new one will be installed. It will take about two weeks so a part of the playground will be closed during that time. We are so proud to honor Kate Beres as Le Jardin Academy's PYP Academic Excellence Award recipient for 2019! From the numerous nominations she received and the heartfelt comments shared, it is abundantly clear that Kate is excellent at what she does and has earned the respect and admiration of our ohana. Join me in acknowledging Kate, her work, and this incredible achievement at LJA's Red Carpet Gala on April 27 at The Pacific Club! Festivities begin at 5:30 p.m. Click here to get tickets or to make a gift in Kate's honor. April 28th is the annual I Love Kailua town party. We will have a sign up for those who would like to come volunteer to set up the event in collaboration with Outdoor Circle. Reserve the morning if you would like to help! Last chance to visit the book fair is tomorrow. Don't forget that there are teacher boxes and you can pick up a book for the classroom library! If you are not returning to LJA next school year, please notify us as soon as possible. Some grade levels are full and it's important for us to know if we have spots for incoming applicants. Email me directly at majken.johansson@lejardinacademy.org. 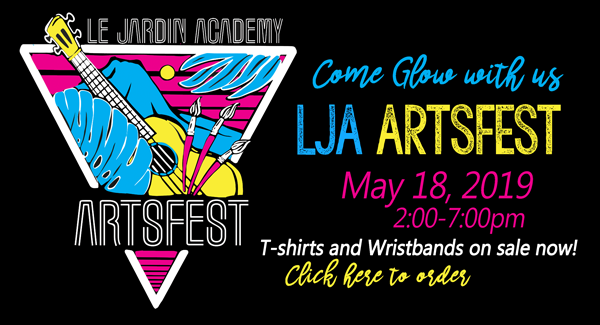 For more information and to pre-order a wrist band and/or T-shirt, click this ARTSFEST 2019 link. This year's Summer Fun theme is "Adventure Around the World," where we will "travel" and experience new cultures near and far. Click this Summer Fun link for more information and to register. Project Grad is selling lei for anyone who would like to purchase. There is quite a nice selection available. Order deadline is April 21 at noon. Click this lei sales link to order. May Day lei requirements for each grade level (as know at this time) is below. Check with your child's teacher as April progresses.